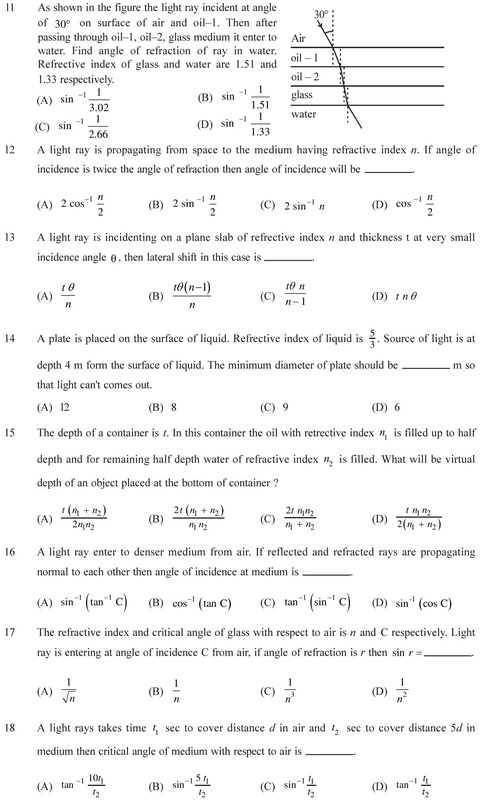 NCERT Solutions for Class 12 Physics Chapter 9 Ray Optics and Optical Instruments in PDF form to free download. 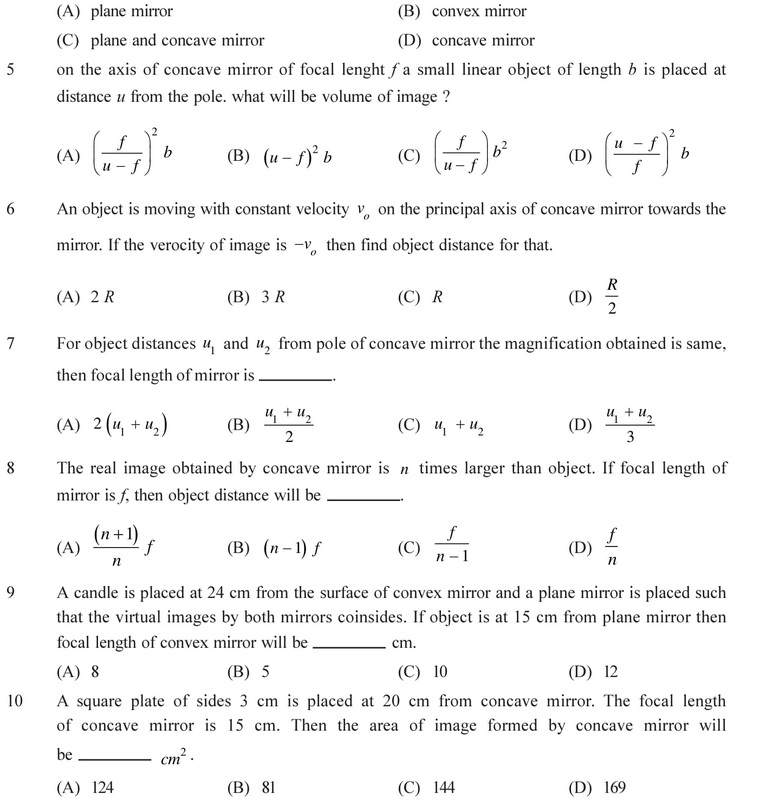 NCERT Solutions for other subjects are also given to download. In order to practice important questions for CBSE Exams, NEET, AIIMS, JEE Mains, GGSIPU, etc., questions with answers are given below. 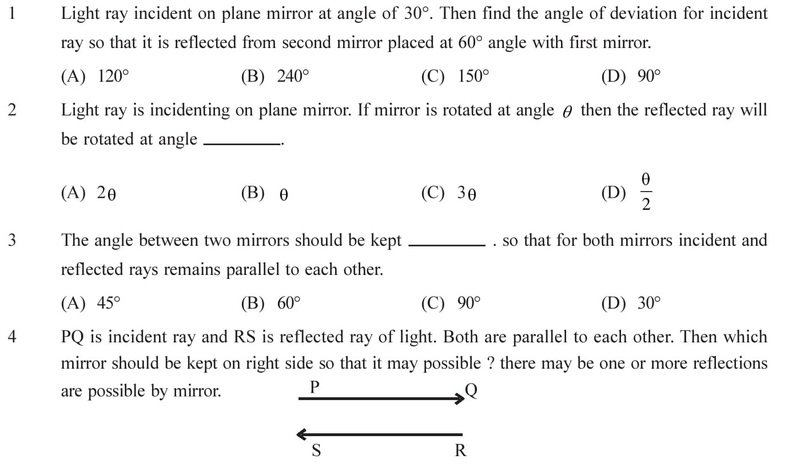 Download NCERT Solutions for Class 12 Physics Chapter 9 Ray Optics and Optical Instruments in PDF form with the links given below. The following are the questions for CBSE Exams as well as competitive exams like medical and non-medical entrance exams like NEET, JEE Mains and advance, BITS entrance exams, etc. 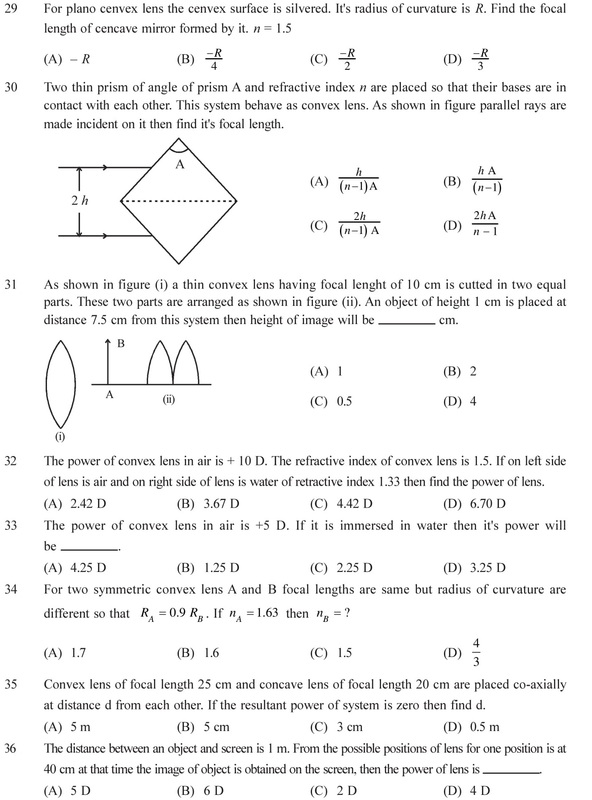 Questions are given topic wise and the answers are given at the end of the page. Reflection of light from plane and spherical mirrors, mirror formula, formation of real, virtual images, concepts of size of image and nature of image. See Answers. Refraction of light with different conditions, Total internal reflection when light passes through denser medium to rarer medium. Critical angle for TIR, Lateral shift. 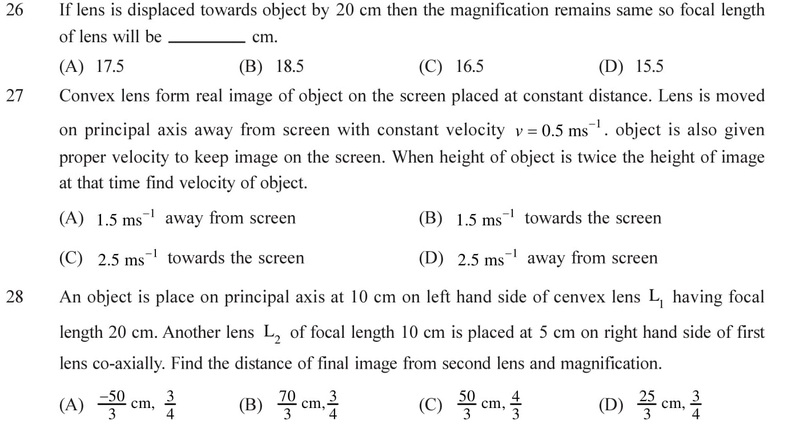 Questions based on real depth and virtual depth. See Answers. 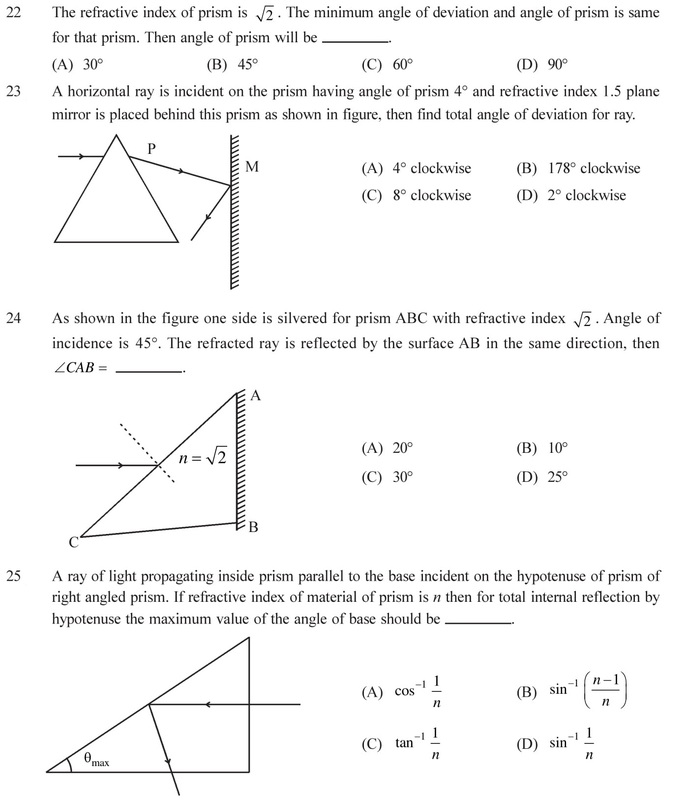 Equations of prism, angle of incident, minimum deviation. Relation between angle of incidents and refractive index. Depressive power and maximum angle of depression. See Answers. Equations of lens, Magnification, power of lens and Combinations of thin lens. Lens maker formula, Gauss’s equation, lateral magnification, Newton’s equation, longitudinal magnification, arial magnification and power of combination of lens. See Answers. Microscope and Astronomical telescope (Reflecting and Refracting type) and their magnification power. Magnification of simple and compound microscope, Terrestrial telescope and their uses. See Answers. 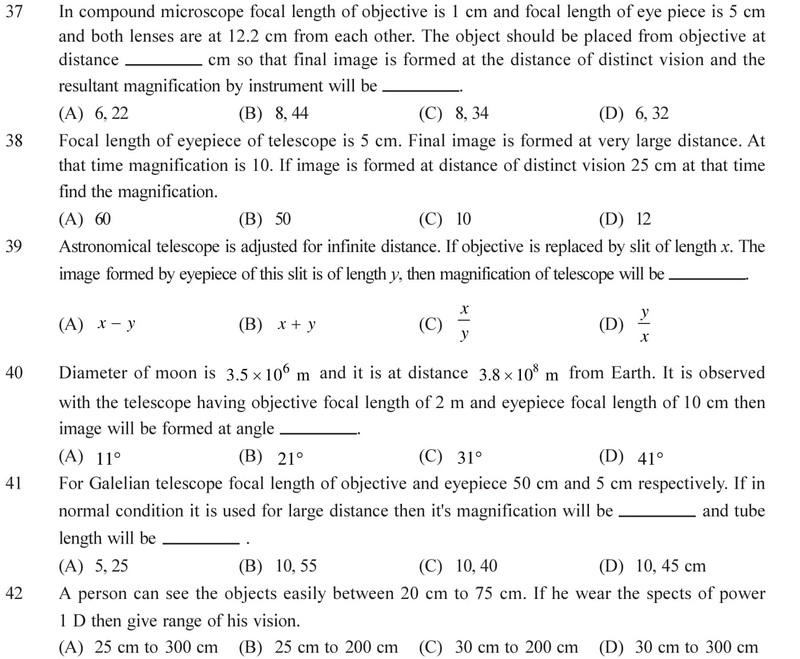 1 (B), 2 (A), 3 (C), 4 (D), 5 (A), 6 (C), 7 (B), 8 (A), 9 (A), 10 (B), 11 (C), 12 (A), 13 (B), 14 (D), 15 (A), 16 (C), 17 (D), 18 (B), 19 (A), 20 (C), 21 (B), 22 (D), 23 (B), 24 (C), 25 (A), 26 (A), 27 (B), 28 (C), 29 (D) 30 (A), 31 (B), 32 (D), 33 (B), 34 (A), 35 (B) 36 (A), 37 (B), 38 (D), 39 (C), 40 (A), 41 (D), 42 (A).